The weather this fall has been unseasonably warm. I have no problem with that. It's been so fun being outside and not sweating or freezing to death. Brian and I have been happy to go mountain biking every week. There are so many awesome trails around us. We live in a pretty incredible place. Have you seen this bridge? It's in the oddest spot. 5ish years ago Brian and I took the girls biking along the Bonneville Shoreline trail starting at the Corner Canyon road in Draper. We rode the trail north until we reached a section that was way too steep and dangerous for us to attempt, we turned around and rode back. It was a nice introduction to mountain biking for the girls. 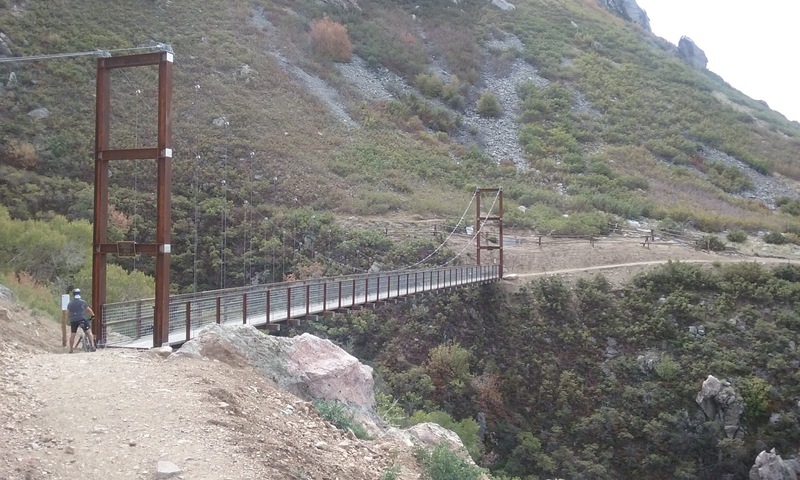 This past spring Sandy/Draper constructed a bridge that spans the steep and dangerous section along the trail. Brian and I had a fun time riding back and forth on it. It was pretty neat. It's time to put the garden to bed for the winter. Brian has been working diligently to get it all cleaned out, tilled up, and ready for next spring. It's a lot of work. These are the gourds he grew this year. I love looking at them. I have no idea what we will do with all of them but they make me smile. Sydney went to her school's college day and she listened to a presentation from a school called Colorado Mesa University. She was very intrigued. It's located in Grand Junction, Colorado a mere 4 hours and 15 minutes from our home. Brian had time off during fall break so we decided to go visit Grand Junction. It was a great trip. We took the mountain bikes and enjoyed that. We stopped for lunch at a place call the Hot Tomato Cafe in Fruita, Co. I highly recommend eating there if you happen to be in the area. We all loved this pizza place. I could see it as being a fantastic college hangout. Syd wondered if she could get a job there if she ends up going to school at CMU. One of the rides we did was called Horse Thief. It was a beautiful and challenging ride. We did a bit of b-hiking and a bit of riding. We spent one morning doing a campus tour at CMU. They have amazing facilities and an outstanding outdoor recreation program. So many opportunities to try new things. Still, it's not a done deal. Sydney really doesn't know where she wants to go for school. Fortunately she has time to decide. Unfortunately for me that time is going to pass way too quickly. I love these peeps of mine. You have such a fun family! Glad you had a great little vacay. Thanks Emily. They are awesome to hang out with!